The 27 year old “kid” from Stockton has been fighting in the world of mixed martial arts since 2004 where he made his debut at WEC 12 defeating Alex Gracia via triangle choke in the third round. Diaz went 5-2 before he was a contestant on The Ultimate Fighter 5, which exclusively featured lightweights, fighting on Jens Pulver‘s team. In the preliminary round, Diaz defeated Rob Emerson by submission; in the quarterfinals he defeated fellow Team Pulver teammate Corey Hill (who was a favorite at the time) via triangle choke in the first round. In the semifinals, Diaz defeated Team Penn member Gray Maynard by submission, advancing to the finals where he faced teammate Manny Gamburyan. After losing the first round, Diaz won by submission after Gamburyan was forced to tap out in the second round due to the dislocation of his right shoulder as the result of attempting a takedown. With the victory, Diaz became the winner of The Ultimate Fighter 5. After winning the show, Diaz went on a four fight winning streak defeating names like Kurt Pellegrino, Alvin Robinson, Junior Assunção and Josh Neer. Diaz received two submission of the nights and one FOTN honor(s). From there, Diaz was put to the true test against dominate wrestlers Clay Guida and Joe Stevenson where he suffered losses in both fights via decisions (Both Fights where given FOTN honors). Diaz tapped out Melvin Guillard before suffering another close decision loss in a rematch to Gray Maynard. 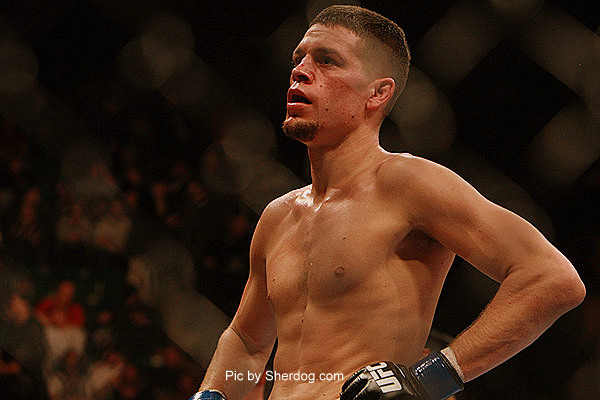 Diaz decided a move up to welterweight would be a good move. “The Kid From Stockton” went 2-2, winning two in a row, and losing two in a row before returning to lightweight. Diaz returned to lightweight facing off against top contender (at the time) Takanori Gomi and ran through him with precise striking and a dangerous ground game. Since his return to 155, Diaz has tore up his competition going 3-0 beating the likes of Donald Cerrone and Jim Miller. Since his return, Diaz has two submission of the night(s), one FOTN, and has earned himself a title shot this Saturday at UFC on Fox 5 where he is set to take on lightweight champion Benson Henderson. Diaz has had two finishes in his last three fights and one of them is against Jim Miller who Henderson couldn’t finish. Henderson has not had a finish in his last 5 fights (no finishes in the UFC either). Diaz has 9 finishes in the UFC with 5 submission of night honors. If Henderson chooses to keep this standing, he will be in for a rude awakening. Diaz’s reach and aggression will win him the stand-up war. Everyone thinks if it stays standing that Henderson will apply the same game-plan that Condit did against older brother Nick, but I don’t think Henderson’s kicks and stand up is as good and precise as Carlos Condit’s. Henderson’s wrestling ability is by far very superior to Diaz’s, but Diaz isn’t going to try to take this fight to the ground. But if Henderson thinks that’s where he has a chance to win, he might be in for a rude awakening. Benson holds a unanimous victory over Clay Guida (who beat Diaz via split in 2009) where his wrestling was dominate, but Diaz isn’t a one trick pony like Guida. If this goes to the ground, I don’t see Diaz being able to submit the gumby like Henderson, but I do think he can win this fight on the ground. Diaz, in my opinion, is one of the best fighters to fight off his back. Make one mistake and it could be a short night, ask Jim Miller. It’s no secret that when the Diaz brothers fight, that they will bring it right to you, and their reach plays a big role in that department. Henderson is no rookie to the reach advantage having to deal with it with Anthony Njokuani and two fights against Donald Cerrone. The problem is, Diaz will use his reach to add pressure, plus he isn’t afraid to use it to grapple with. Diaz’s arms are very skinny, but he will use his reach to wrap his string-cheese arms around Henderson’s neck if given the chance. Ben Henderson is one of the most motivated guys I have ever met, but to say that he is more motivated than Diaz is an understatement. I have never met or seen a more motivated fighter(s) than the Diaz brothers. This is their camp’s first chance to bring back UFC gold, Diaz’s motivation is through the roof, and I believe he is on his way to becoming the new lightweight champion come Saturday December 8th. Watch Nate Diaz clown fools in the video below. Video courtesy of YouTube uploader Bruthamuzone.